Wuyi Yue is currently a professor at the Faculty of Intelligence and Informatics, and Dean of the Graduate School of Natural Science, Konan University, Japan. Dr. Yue is a fellow of the ORSJ, a senior number of IEICE, Japan and a member of the IEEE. Dr. Yue’s research interests include queueing theory, stochastic processes and optimal methods as well applied to system modeling, performance analysis and optimal resource allocation of communication networks, systems engineering, and operations research. Dr. Yue is an author (a co-author) and a co-editor of more than 10 monographs published by Springer and other Publishers, and more than 300 refereed papers published in journals such as IEEE Transactions and IEICE Transactions, and in proceedings of IEEE, ACM, LNCS, Springer. Dr. Yue also edited more than 20 Special Issues as a first editor or a co-editor such as “System Science and Optimization Approaches to Nonlinear Dynamics and System Theory with High Technology Applications” (I and II) to International Journal: Nonlinear Dynamics and Systems Theory, “System Sciences and Optimization with High Technology Applications,” to Journal of Optimization and Engineering (OPTE), “Advances in Queueing Theory and Network Applications” to Journal of Industrial and Management Optimization, “System Sciences and Optimization with High Technology Applications,” to Pacific Journal of Optimization, “Optimization Techniques and Its Applications,” to Optimization Letters, Springer, and Conference Proceedings Books: Queueing Theory and Network Applications, Lecture Notes in Computer Science (LNCS), Knowledge and Systems Sciences, Communications in Computer and Information Science (CCIS), Springer. Yutaka Takahashi is a professor emeritus of Kyoto University and currently a professor at the Kyoto College of Graduate Studies for Informatics. He has been very actively working in the field of computer science, communication networks, operation research and systems science. In particular, he has contributed to performance modeling and analysis of communication systems. He was the founding co-chairman of IFIPWG6.3 for Performance Evaluation of Communication Systems and holding the position from 1993 to 2002. He has been also an Elected Full Member of IFIP WG7.3 and WG6.2 since 1997. In appreciation for his continuing contribution to IFIP, he was awarded Silver Core by IFIP. He has been world-widely serving more than 230 international conferences and symposiums as organizer, program chair, advisory committee member and program committee member, and he is currently serving four international journals and one series of books as an editor. He has edited eight books related to his research fields and published more than 180 refereed papers in internationally established journals such as IEEE Transactions, Journal of Operations Research Society of America, Performance Evaluation, Queueing Systems and conference proceedings such as IFIP conferences, ACM conferences, IEEE conferences. We, as guest editors, deeply indebted to many people for their great help during the multiple phases of publishing this special issue. We first would like to express our sincere gratitude to all reviewers for their valuable comments concerning all the papers. The reviewers’ reports not only helped us qualify the papers in this special issue, but also improved their quality in presentation. Then we are heartily grateful to all the authors for their contribution to this special issue. Their tremendous efforts in providing excellent papers made this special issue very attractive and informative. 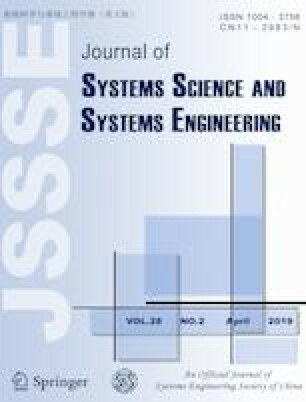 We would like to express our appreciation to the Editorsin-Chief of Journal of Systems Science and Systems Engineering, professor Jian Chen and the staff members at Springer Publishers, Inc. for their excellent support to complete our editorial works. We hope that the readers will find the contributions of this special issue informative and inspiring.